Wouldn’t it be nice to have a quick pick-me-up for your skin? Wouldn’t you like to have a brief, fast-working treatment that would leave you looking and feeling younger and more radiant? There’s good news! You can pamper yourself with the Dermalogica IonActive Power Treatment and see immediate improvements in the health of your skin. Of course, you cannot expect spectacular results with everyday products and household elixirs. You need the best of the best. You need a strong, top-notch, effective treatment with ingredients used by professionals. You need a fix that has proven results and will not have you spending your whole day to receive it. No matter what your skin type or condition, there is always room for improvement. The Dermalogica IonActive Power Treatment is designed to help issues such as aging skin, discoloration, acne, and dryness. More than just a typical facial, the proper treatment for you will be chosen based on an assessment of your skin’s needs. There are unique serums designated for each individual skin issue. These solutions are placed on the skin and professional equipment is used to help the skin absorb the rejuvenating ingredients. The treatment also contains 2 unique gel masks. The ExoThermal Gelloid targets aging or dry skin. The EndoThermal Gelloid helps calm and sooth irritated, sensitive skin. The mask will be selected based on your individual needs and skin type. These masks are applied over the serum and then LED equipment is used to recharge the skin. The process is relaxing and gentle. It is a simple process that will refresh your looks and boost your confidence. Results depend on the person and the condition of their skin. The more treatments you receive, the more noticeable your results will be. After the facial, the professional skin therapist can explain the proper regimen to keep your skin on a healthy and radiant path. You should follow any recommended steps and use suggested products. Receiving this powerful treatment on a more frequent basis may be necessary for your condition. 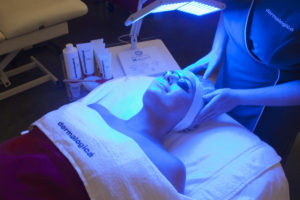 You probably want to be pampered and treated to a relaxing face treatment that leaves your skin fresh and rejuvenated. You probably dream of looking in the mirror and finding younger, smoother, moisturized skin. You can have these effects by choosing the Dermalogical IonActive Power Treatment today. Being treated and pampered to rejuvenated skin doesn’t require a long, expensive trip to a spa. Having your skin recharged doesn’t require a whole day of your time. The Dermalogical IonActive Power Treatment is performed in just 45 minutes! And the results are instant! Imagine going about your day and popping in for a quick but effective facial. You will be out in no time to resume your day with clearer, refreshed skin. The soothing effect will relax you and the results will bring out the confidence in you. Treat yourself to the Best Facial in Citrus Heights because you deserve it.